Animation 1: Click the image to view the animation. The changing periodogram for different in-sample sizes and selecting an appropriate band-pass component to the multi-bandpass filter. In my previous article, the third installment of the Frequency Effect trilogy, I introduced the multi-bandpass (MBP) filter design as a practical device for the extraction of signals in financial data that can be used for trading in multiple types of market environments. As depicted through various examples using daily log-returns of Google (GOOG) as my trading platform, the MBP demonstrated a promising ability to tackle the issue of combining both lowpass filters to include a local bias and slow moving trend while at the same time providing access to higher trading frequencies for systematic trading during sideways and volatile market trajectories. I identified four different types of market environments and showed through three different examples how one can attempt to pinpoint and trade optimally in these different environments. As my empirical framework was fixed in that I applied the designed filters to only one asset throughout the study and for a fixed time span of a year worth of in-sample data applied to 90 days out-of-sample, results showing the MBP framework applied to other assets and time frames might have made my presentation of this new design more convincing. Taking this relevant issue of limited empirical framework into account, I am extending my previous article many steps further by presenting in this article the creation of a collection of financial trading signals based entirely on the MBP filter. The purpose of this article is to further solidify the potential for MBP filters and extend applications of the new design to constructing signals for various types of financial assets and in-sample/out-of-sample time frames. To do this I will create a portfolio of assets comprised of a group of well known companies coupled with two commodity ETFs (exchange traded funds) and apply the MBP filter strategy to each of the assets using various out-of-sample time horizons. Consequently, this will generate a portfolio of trading signals that I can track over the next several months. In choosing the assets for my portfolio, I arranged a group of companies/commodities whose products or services I use on a consistent basis (as arbitrary as any other portfolio selection method, right?). To this end, I chose Verizon (VZ) (service provider for my iPhone5), Microsoft (MSFT) (even though I mostly use Linux for my computing needs), Toyota (TM) ( I drive a Camry), Coffee (JO) (my morning espresso keeps the wheels turning), and Gold (GLD) (who doesn’t like Gold, a great hedge to any currency). For each of these assets, I built a trading signal using various in-sample time periods beginning summer of 2011 and ending toward the end of summer 2012, to ensure all seasonal market effects were included. The out-of-sample time period in which I test the performance of the filter for each asset ranges anywhere from 90 days to 125 days out-of-sample. I tried to keep the selection of in-sample and out-of-sample points as arbitrary as possible. And so here we go. The performance of the portfolio. In order to work with commodities in this portfolio, the easiest way is through the use of ETFs that are traded in open markets just as any other asset. I chose the Dow Jones-UBS Coffee Subindex JO which is intended to reflect the returns that are potentially available through an unleveraged investment in one futures contract on the commodity of coffee as well as the rate of interest that could be earned on cash collateral invested in specified Treasury Bills. To create the MBP filter for the JO index, I used JO and USO (a US Oil ETF) as the explanatory series from the dates of 5-5-2011 until 1-13-2013 (just a random date I picked from mid 2011, cinqo de mayo) and set the initial low-pass portion for the trend component of the MBP filter to [0, .17]. After a significant amount of regularization was applied, I added a bandpass portion to the filter by initializing an interval at [.4, .5]. This corresponded to the principal spectral peak in the periodogram which was located just below for the coffee fund. After setting the number of out-of-sample observations to 110, I then proceeded to optimize the regularization parameters in-sample while ensuring that the transfer functions of the filter were no greater than 1 at any point in the frequency domain. The result of the filter is plotted below in Figure 1, with the transfer functions of the filters plotted below it. The resulting trading signal from the MBP filter is in green and the out-of-sample portion after the cyan line, with the cumulative return on investment (ROI) percentage in blue-pink and the daily price of JO the coffee fund in gray. Figure 1: The MBP filter for JO applied 110 Out-of-sample points (after cyan line). Figure 2: Transfer function for the JO and USO MBP filters. Notice the out-of-sample portion of 110 observations behaving akin to the in-sample portion before it, with a .97 rank coefficient of the cumulative ROI resulting from the trades. The ROI in the out-of-sample portion was 32 percent total and suffered only 4 small losses out of 18 trades. The concurrent transfer functions of the MBP filter clearly indicate where the principal spectral peak for JO (blue-ish line) is directly under the bandpass portion of the filter. Notice the signal produced no trades during the steepest descent and rise in the price of coffee, while pinpointing precisely at the right moment the major turning point (right after the in-sample period). This is exactly what you would like the MBP signal to achieve. Figure 4 : The Transfer Functions for the GLD and DIG filter. Figure 5: Coefficients for the GLD and DIG filters. Each are of length 76. The smoothness and decay in the coefficients is quite noticeable along with a slight lag correlation along the middle of the coefficients between lags 10 and 38. This trio of characteristics in the above three plots is exactly what one strives for in building financial trading signals. 1) The smoothness and decay of the coefficients, 2) the transfer functions of the filter not exceeding 1 in the low and band pass, and 3) linear performance both in-sample and out-of-sample of the trading signal. The experience of engineering a trading signal for Verizon was one of the longest and more difficult experiences out of the 5 assets in this portfolio. Strangely a very difficult asset to work with. Nevertheless, I was determined to find something that worked. To begin, I ended up using AAPL as my explanatory series (which isn’t a far fetched idea I would imagine. After all, I utilize Verizon as my carrier service for my iPhone 5). After playing around with the regularization parameters in-sample, I chose a 124 day out-of-day horizon for my Verizon to apply the filter to and test the performance. Surprisingly, the cross regularization seemed to produce very good results both out-of-sample. This was the only asset in the portfolio that required a significant amount of cross regularization, with the parameter touching the vicinity of .24. Another surprise was how high the timeliness parameter was (40) in order to produce good in-sample and out-of-sample trading results. By far the highest amount of the 5 assets in this study. The amount of smoothing from the weighting function $W(\omega; \alpha)$ was also relatively high, reaching a value of 20. The out-of-sample performance is shown in Figure 6. Notice how dampened the values of the trading signal are in this example, where the local bias during the long upswings is present, but not visible due to the size of the plot. The out-of-sample performance (after the cyan line) seems to be superior to that of the in-sample portion. This is most likely due to the fact that the majority of the frequencies that we were interested in, near , failed to become prominent in the data until the out-of-sample portion (there were around 120 trading days not shown in the plot as I only keep a maximum of 250 plotted on the canvas). With 124 out-of-sample observations, the signal produced a performance of 44 percent ROI. The filter seems to cleanly and consistently pick out local turning points, although not always at their optimal point, but the performance is quite linear, which is exactly what you strive for. Figure 6: The out-of-sample performance on 124 observations from 7-2012 to 1-13-2013. In the Microsoft data I used a time span of a year and three months for my in-sample period and a 90 day out-of-sample period from August through 1-13-2012. My explanatory series was GOOG (the search engine Bing and Google seem to have quite the competition going on, so why not) which seemed to correlate rather cleanly with the share price of MSFT. The first step in obtaining a bandpass after setting my lowpass filter to [0, .2] was to locate the principal spectral peak (shown in the periodogram figure below). I then adjusted the width until I had near monotone performance in-sample. Once the customization and regularization parameters were found, I applied the MSFT/AAPL filter to the 90 day out-of-sample period and the result is shown below. Notice that the effect of the local bias and slow moving trends from the lowpass filter are seen in the output trading signal (green) and help in identifying the long down swings found in the share price. During the long down swings, there are no trades due to the local bias from frequency zero. Figure 8: Microsoft trading signal for 90 out-of-sample observations. The ROI out-of-sample is 31 percent. Figure 9: Aggregate periodogram of MSFT and Google showing the principal spectral peak directly inside the bandpass. Figure 10: The coefficients for the MSFT and GOOG series up to lag 76. With a healthy amount of regularization applied to the coefficient space, we can clearly see the smoothness and decay towards the end of the coefficient lags. The cross regularization parameter provided no improvement to either in-sample or out-of-sample performance and was left set to 0. Despite the superb performance of the signal out-of-sample with a 31 percent ROI in 90 days in a period which saw the share price descend by 10 percent, and relatively smooth decaying coefficients with consistent performance both in and out-of-sample, I still feel like I could improve on these results with a better explanatory series than AAPL. That is one area of this methodology in which I struggle, namely finding “good” explanatory series to better fortify the in-sample metric space and produce more even more anticipation in the signals. At this point it’s a game of trial and error. I suppose I should find a good market economist to direct these questions to. For the Toyota series, I figured my first explanatory series to test things with would be an asset pertaining to the price of oil. So I decided to dig up some research and found that DIG ( NYSEARCA:DIG), a ProShares ETF, provides direct exposure to the global price of oil and gas (in fact it is leveraged so it corresponds to twice the daily performance of the Dow Jones U.S. Oil & Gas Index). The out-of-sample performance, with heavy regularization in both smooth and decay, seems to perform quite consistently with in-sample, The signal shows signs of patience during volatile upswings, which is a sign that the local bias and slow moving trend extraction is quietly at work. Otherwise, the gains are consistent with just a few very small losses. At the end of the out-of-sample portion, namely the past several weeks since Black Friday (November 23rd), notice the quick climb in stock price of Toyota. The signal is easily able to deduce this fast climb and is now showing signs of slowdown from the recent rise (the signal is approaching the zero crossing, that’s how I know). I love what you do for me, Toyota! (If you were living in the US in the1990s, you’ll understand what I’m referring to). Figure 11: Out-of-sample performance of the Toyota trading signal on 85 trading days. Figure 12: Coefficients for the TM and DIG log-return series. Figure 13: The transfer functions for the TM and DIG filter coefficients. The coefficients for the TM and DIG series depicted in Figure 12 show the heavy amount of smooth and decay (and decay2) regularization, a trio of parameters that was not easy to pinpoint at first without significant leakage above one in the filter transfer functions (shown in Figure 13). One can see that two major spectral peaks are present under the lowpass portion and another large one in the bandpass portion that accounts for the more frequent trades. With these trading signals constructed for these five assets, I imagine I have a small but somewhat diverse portfolio, ranging from tech and auto to two popular commodities. I’ll be tracking the performance of these trading signals together combined as a portfolio over the next few months and continuously give updates. As the in-sample periods for the construction of these filters ended around the end of last summer and were already applied to out-of-sample periods ranging from 90 days to 124 (roughly one half to one third of the original in-sample period), with the significant amount of regularization applied, I am quite optimistic that the out-of-sample performance will continue to be the same over the next few months, but of course one can never be too sure of anything when it comes to market behavior. In the worse case scenario, I can always look into digging though my dynamic adaptive filtering and signal extraction toolkit. Lastly, if you have a particular financial asset for which you would like to build a trading signal (similar to the examples shown above), I will be happy to take a stab at it using iMetrica (and/or give you pointers in the right direction if you would prefer to pursue the endeavor yourself). Just send me what asset you would like to trade on, and I’ll build the filter and send you the coefficients along with the parameters used. Offer holds for a limited time only! Animation of the out-of-sample performance of one of the multibandpass filters built in this article for the daily returns of the price of Google. The resulting trading signal was extracted and yielded a trading performance near 39 percent ROI during an 80 day out-of-sample period on trading shares of Google. long downswings/trends in share price. Using MDFA for signal extraction in financial time series, one typically indicates an a priori trading strategy through the design of the extractor, namely the target function (see my previous two articles on The Frequency Effect). Designating a lowpass or bandpass filter in the frequency domain will give an indication of what kind of patterns the extracted trading signal will trade on. Traditionally one can set a lowpass with the goal of extracting trends (with the proper amount of timeliness prioritized in the parameterization), or one can opt for a bandpass to extract smaller cyclical events for more systematic trading during volatile periods. But now suppose we could have the best of both worlds at the same time. Namely, be profitable in both steady climbs and long tumbles, while at the same time systematically hacking our way through rough sideways volatile territory, making trades at specific frequencies embedded in the share price actions not found in long trends. The answer is through the construction of multi-band pass filters. Their construction is relatively simple, but as I will demonstrate in this article with many examples, they are a bit more difficult to pinpoint optimally (but it can be done, and the results are beautiful… both aesthetically and financially). With the multi-bandpass defined as two separate bands given by , with and , zero everywhere else, it is easy to see that the motivation here is to seek a detection of both lower frequencies and low-mid frequencies in the data concurrently. With now up to four cutoff frequencies to choose from, this adds yet another few wrinkles in the degrees of freedom in parameterizing the MDFA setup. If choosing and optimizing one cutoff frequency for a simple low-pass filter in addition to customization and regularization parameters wasn’t enough, now imagine extracting signals with the addition of up to three more cutoff frequencies. Despite these additional degrees of freedom in frequency interval selection, I will later give a couple of useful hacks that I’ve found helpful to get one started down the right path toward successful extraction. With this multi-bandpass definition for comes the responsibility to ensure that the customization of smoothness and timeliness is adjusted for the additional passband. The smoothing function for that acts on the periodogram (or discrete Fourier transforms in multivariate mode) is now defined piecewise according to the different intervals , , and . For example, gives a piecewise quadratic weighting function (an example shown in Figure 1) and for , the weighting function is piecewise linear. In practice, the piecewise power function smooths and rids of unwanted frequencies in the stop band much better than using a piecewise constant function. With these preliminaries defined, we now move on to the first steps in building and applying multiband pass filters. Figure 1: Plot of the Piecewise Smoothing Function for alpha = 15 on a mutli-band pass filter. To motivate this newly customized approach to building financial trading signals, I begin with a simple example where I build a trading signal for the daily share price of Google. We begin with a simple lowpass filter defined by if , and 0 otherwise. This formulation, as it includes the zero frequency, should provide a local bias as well as extract very slow moving trends. The trick with these filters for building consistent trading performance is ensure a proper grip on the timeliness characteristics of the filter in a very low and narrow filter passage. Regularization and smoothness using the weighting function shouldn’t be too much of a problem or priority as typically just only a small fraction of the available degrees of freedom on the frequency domain are being utilized, so not much concern for overfitting as long as you’re not using too long of a filter. In my example, I maxed out the timeliness parameter and set the regularization parameter to .3. Fortunately, no optimization of any parameter was needed in this example, as the performance was spiffy enough nearly right after gauging the timeliness parameter . Figure 2 shows the resulting extracted trend trading signal in both the in-sample portion (left of the cyan colored line) and applied to 80 out-of-sample points (right of the cyan line, the most recent 80 daily returns of Google, namely 9-29-12 through today, 1-10-13). The blue-pink line shows the progression of the trading account, in return-on-investment percentage. The out-of-sample gains on the trades made were 22 percent ROI during the 80 day period. Figure 2: The in-sample and out-of-sample gains made by constructing a low-pass filter employing a very high timeliness parameter and small amount of regularization in smoothness. The out-of-sample gains are nearly 30 percent and no losses on any trades. Although not perfect, the trading signal produces a monotonic performance both in-sample and out-of-sample, which is exactly what you strive for when building these trend signals for trading. The performance out-of-sample is also highly consistent (in regards to trading frequency and no losses on any trades) with the in-sample performance. With only 4 trades being made, they were done at very interesting points in the trajectory of the Google share price. Firstly, notice that the local bias in the largest upswing is accounted for due to the inclusion of frequency zero in the low pass filter. This (positive) local bias continues out-of-sample until, interestingly enough, two days before one of the largest losses in the share price of Google over the past couple years. A slightly earlier exit out of this long position (optimally at the peak before the down turn a few days before) would have been more strategic; perhaps further tweaking of various parameters would have achieved this, but I happy with it for now. The long position resumes a few days after the dust settles from the major loss, and the local bias in the signal helps once again (after trade 2). The next few weeks sees shorter downtrending cyclical effects, and the signal fortunately turns positively increasingly right before another major turning point for an upswing in the share price. Finally, the third transaction ends the long position at another peak (3), perfect timing. The fourth transaction (no loss or gain) was quickly activated after the signal saw another upturn, and thus is now in the long position (hint: Google trending upward). Figure 3 shows the transfer functions for both the sets of explanatory log-return data and Figure 4 depicts the coefficients for the filter. Notice that in the coefficients plot, much more weight is being assigned to past values of the log-return data with extreme (min and max values) at around lags 15 and 30 for the GOOG coefficients (blue-ish line). The coefficients are also quite smooth due to the slight amount of smooth regularization imposed. Figure 3: Transfer functions for the concurrent trend filter applied to GOOG. Figure 4: The filter coefficients for the log-return data. Now suppose we wish to extract a trading signal that performs like a trend signal during long sweeping upswings or downswings, and at the same time shares the property that it extracts smaller cyclical swings during a sideways or highly volatile period. This type of signal would be endowed with the advantage that we could engage in a long position during upswings, trade systematically during sideways and volatile times, and on the same token avoid aggressive long-winded downturns in the price. Financial trading can’t get more optimistic then that, right? Here is where the magic of the multi-bandpass comes in. I give my general “how-to” guidelines in the following paragraphs as a step-by-step approach. As a forewarning, these signals are not easy to build, but with some clever optimization and patience they can be done. In this new formulation, I envision not only being able to extract a local bias embedded in the log-return data but also gain information on other important frequencies to trade on while in sideways markets. To do this, I set up the lowpass filter as I did earlier on . The choice of is highly dependent on the data and should be located through a priori investigations (as I did above, without the additional bandpass). 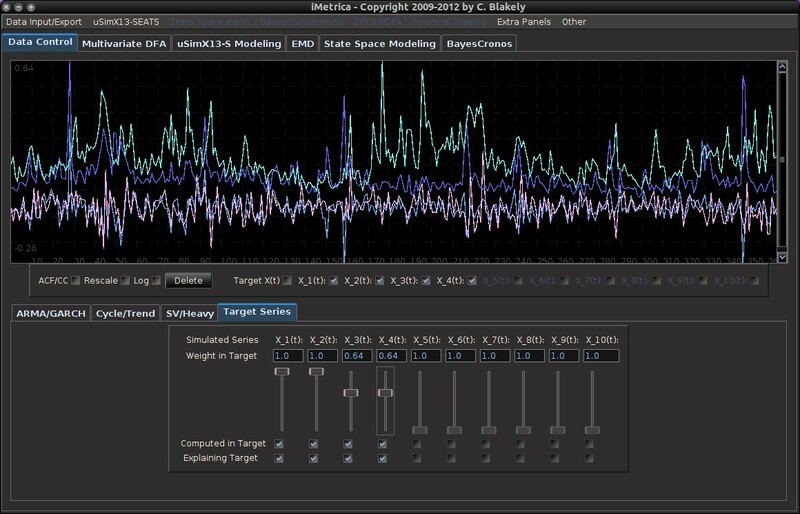 Click on the Animation 2: Example of constructing a multiband pass using the Target Filter control panel in iMetrica. Initially, a low-pass filter is set, then the additional bandpass is added by clicking “Multi-Pass” checkbox. The location is then moved to the desired location using the scrollbars. The new filters are computed automaticall if “Auto” is checked on (lower left corner). Before setting any parameterization regarding customization, regularization, or filter constraints, I perform a quick scan of the periodogram (averaged periodogram if in multivariate mode) to locate what I call principal trading frequencies in the data. In the averaged periodogram, these frequencies are located at the largest spectral peaks, with the most useful ones for our purposes of financial trading typically before . The largest of these peaks will be defined from here on out as the principal spectral peak (PSP). Figure 6 shows an example of an averaged periodogram of the log-return for GOOG and AAPL with the PSP indicated. You might note that there exists a much larger spectral peak located at , but no need to worry about that one (unless you really enjoy transaction costs). I locate this PSP as a starting point for where I want my signal to trade. Figure 5: Principal spectral peak in the log-return data of GOOG and AAPL. In the next step, I place a bandpass of width around .15 so that the PSP is dead-centered in the bandpass. Fortunately with iMetrica, this is a seamlessly simple task with just the use of a scrollbar to slide the positioning of this bandpass (and also adjust the lowpass) to where I desire. Animation 2 above (click on it to see the animation) shows this process of setting a multi-passband in the MDFA Target Filter control panel. Notice as I move the controls for the location of the bandpass, the filter is automatically recomputed and I can see the changes in the frequency response functions instantaneously. With the bandpass set along with the lowpass, we can now view how the in-sample performance is behaving at the initial configuration. Slightly tweaking the location of the bandpass might be necessary (width not so much, in my experience between .15 and .20 is sufficient). The next step in this approach is now to not only adjust for the location of the bandpass while keeping the PSP located somewhat centered, but also adding the effects of regularization to the filter as well. 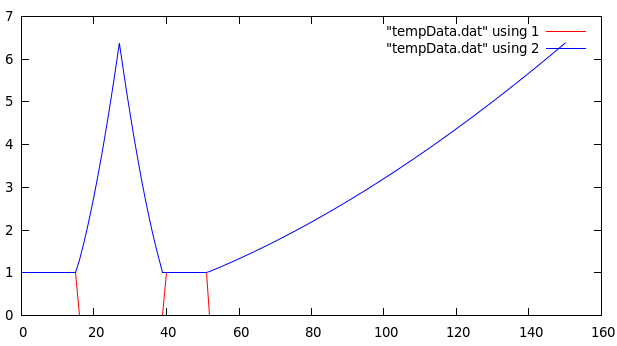 With this additional bandpass, the filter has a tendency to succumb to overfitting if one is not careful enough. In my first filter construction attempt, I placed my bandpass at with the PSP directly under it. I then optimized the regularization controls in-sample (a feature I haven’t discussed yet) and slightly tweaked the timeliness parameter (ended up setting it to 3) and my result (drumroll…) is shown in Figure 6. Figure 6: The trading performance and signal for the initial attempt at a building a multiband pass fitler. Not bad for a first attempt. I was actually surprised at how few trades there were out-of-sample. Although there are no losses during the 80 days out-of-sample (after cyan line), and the signal is sort of what I had in mind a priori, the trades are minimal and not yielding any trading action during the period right after the large loss in Google when the market was going sideways and highly volatile. Notice that the trend signal gained from the lowpass filter indeed did its job by providing the local bias during the large upswing and then selling directly at the peak (first magenta dotted line after the cyan line). There are small transactions (gains) directly after this point, but still not enough during the sideways market after the drop. I needed to find a way to tweak the parameters and/or cutoff to include higher frequencies in the transactions. In my second attempt, I kept the regularization parameters as they were but this time increased the bandpass to the interval , with the PSP still underneath the bandpass, but now catching on to a few more higher frequencies then before. I also slightly increased the length of the filter to see if that had any affect. After optimizing on the timeliness parameter in-sample, I get a much improved signal. Figure 7 shows this second attempt. Figure 7: The trading performance and signal for the second attempt at construction a multiband pass filter. This one included a few more higher frequencies. Upon inspection, this signal behaves more consistently with what I had in mind. Notice that directly out-of-sample during the long upswing, the signal (barely) shows signs of the local bias, but enough not to make any trades fortunately. However, in this signal, we see that filter is much too late in detecting the huge loss posted by Google, and instead sells immediately after (still a profit however). Then during the volatile sideways market, we see more of what we were wishing for; timely trades to the earn the signal a quick 9 percent in the span of a couple weeks. Then the local bias kicks in again and we see not another trade posted during this short upswing, taking advantage of the local trend. This signal earned a near 22 percent ROI during the 80 day out-of-sample trading period, however not as good as the previous signal at 32 percent ROI. Now my priority was to find another tweak that I could perform to change the trading structure even more. I’d like it to be even more sensitive to quick downturns, but at the same time keep intact the sideways trading from the signal in Figure 7. My immediate intuition was to turn on the i2 filter constraint and optimize the time-shift, similar to what I did in my previous article, part deux of the Frequency Effect. I also lessened the amount of smoothing from my weighting function , turned off any amount of decay regularization that I had and voila, my final result in Figure 8. Figure 8: Third attempt at building a multiband pass filter. Here, I turn on i2 filter constraint and optimize the time shift. While the consistency with the in-sample performance to out-of-sample performance is somewhat less than my previous attempts, out-of-sample performs nearly exactly how I envisioned. There are only two small losses of less than 1 percent each, and the timeliness of choosing when to sell at the tip of the peak in the share price of Google couldn’t have been better. There is systematic trading governed by the added multiband pass filter during the sideways and slight upswing toward the end. Some of the trades are made later than what would be optimal (the green lines enter a long position, magenta sells and enters short position), but for the most part, they are quite consistent. It’s also very quick in pinpointing its own erronous trades (namely no huge losses in-sample or out of sample). There you have it, a near monotonic performance out-of-sample with 39 percent ROI. In examining the coefficients of this filter in Figure 9, we see characteristics of a trend filter as coefficients are largely weighting the middle lags much more than than initial or end lags (note that no decay regularization was added to this filter, only smoothness) . While at the same time however, the coefficients also weight the most recent log-return observations unlike the trend filter from Figure 4, in order to extract signals for the more volatile areas. The undulating patterns also assist in obtaining good performance in the cyclical regions. Figure 9: The coefficients of the final filter depicting characteristics of both a trend and bandpass filter, as expected. Finally, the frequency response functions of the concurrent filters show the effect of including the PSP in the bandpass (figure 10). Notice, the largest peak in the bandpass function is found directly at the frequency of the PSP, ahh the PSP. I need to study this frequency with more examples to get a more clear picture to what it means. In the meantime, this is the strategy that I would propose. If you have any questions about any of this, feel free to email me. Until next time, happy extracting! Figure 10: The frequency response functions of the multi-bandpass filter. Animation 1: The out-of-sample performance over 60 trading days of a signal built using an optimized time-shift criterion. With 5 trades and 4 successful, the ROI is nearly 40 percent over 3 month. What is an optimized time-shift? Is it important to use when building successful financial trading signals? While the theoretical aspects of the frequency zero and vanishing time-shift can be discussed in a very formal and mathematical manner, I hope to answer these questions in a more simple (and applicable) way in this article. To do this, I will give an informative and illustrated real world example in this unforeseen continuation of my previous article on the frequency effect a few days ago. I discovered something quite interesting after I got an e-mail from Herr Doktor Marc (Wildi) that nudged me even further into my circus of investigations in carving out optimal frequency intervals for financial trading (see his blog for the exact email and response). So I thought about it and soon after I sent my response to Marc, I began to question a few things even further at 3am in the morning while sipping on some Asian raspberry white tea (my sleeping patterns lately have been as erratic as fiscal cliff negotiations), and came up with an idea. Firstly, there has to be a way to include information about the zero-frequency (this wasn’t included in my previous article on optimal frequency selection). Secondly, if I’m seeing promising results using a narrow band-pass approach after optimizing the location and distance, is there anyway to still incorporate the zero-frequency and maybe improve results even more with this additional frequency information? Frequency zero is an important frequency in the world of nonstationary time series and model-based time series methodologies as it deals with the topic of unit roots, integrated processes, and (for multivariate data) cointegration. Fortunately for you (and me), I don’t need to dwell further into this mess of a topic that is cointegration since typically, the type of data we want to deal with in financial trading (log-returns) is closer to being stationary (namely close to being white noise, ehem, again, close, but not quite). Nonetheless, a typical sequence of log-return data over time is never zero-mean, and full of interesting turning points at certain frequency bands. In essence, we’d somehow like to take advantage of that and perhaps better locate local turning points intrinsic to the optimal trading frequency range we are dealing with. The perfect way to do this is through the use of the time-shift value of the filter. The time-shift is defined by the derivative of the frequency response (or transfer) function at zero. Suppose we have an optimal bandpass set at where . We can introduce a constraint on the filter coefficients so as to impose a vanishing time-shift at frequency zero. As Wildi says on page 24 of the Elements paper: “A vanishing time-shift is highly desirable because turning-points in the filtered series are concomitant with turning-points in the original data.” In fact, we can take this a step further and even impose an arbitrary time-shift with the value at frequency zero, where is any real number. In this case, the derivative of the frequency response function (transfer function) at zero is . As explained on page 25 of Elements, this is implemented as , which implies . This constraint can be integrated into the MDFA formulation, but then of course adds another parameter to an already full-flight of parameters. Furthermore, the search for the optimal with respect to a given financial trading criterion is tricky and takes some hefty computational assistance by a robust (highly nonlinear) optimization routine, but it can be done. In iMetrica I’ve implemented a time-shift turning point optimizer, something that works well so far for my taste buds, but takes a large burden of computational time to find. To illustrate this methodology in a real financial trading application, I return to the same example I used in my previous article, namely using daily log-returns of GOOG and AAPL from 6-3-2011 to 12-31-2012 to build a trading signal. This time to freshen things up a but, I’m going to target and trade shares of Apple Inc. instead of Google. Quickly, before I begin, I will swiftly go through the basic steps of building trading signals. If you’re already familiar, feel free to skip down two paragraphs. Choosing the appropriate preliminary in-sample metric space is beyond the scope of this article, but will certainly be discussed in a future article. Once this in-sample metric space has been chosen, one can then proceed by choosing the optimal extractor (the frequency bandpass interval) for the metric space. While concurrently selecting the optimal extractor, one must begin warping and bending the preliminary metric space through the use of the various customization and regularization tools (see my previous Frequency Effect article, as well as Marc’s Elements paper for an in-depth look at the mathematics of regularization and customization). These are the principle steps. Now let’s look at an example. In the .gif animation at the top of this article, I featured a signal that I built using this time-shift optimizer and a frequency bandpass extractor heavily centered around the frequency , which is not a very frequent trading frequency, but has its benefits, as we’ll see. The preliminary metric space was constructed by an in-sample period using the daily log-returns of GOOG and AAPL and AAPL as my target is from 6-4-2011 to 9-25-2012, nearly 16 months of data. Thus we mention that the in-sample includes many important news events from Apple Inc. such as the announcement of the iPad mini, the iPhone 4S and 5, and the unfortunate sad passing of Steve Jobs. I then proceeded to bend the preliminary metric space with a heavy dosage of regularization, but only a tablespoon of customization¹. Finally, I set the time-shift constraint and applied my optimization routine in iMetrica to find the value that yields the best possible turning-point detector for the in-sample metric space. The result is shown in Figure 1 below in the slide-show. The in-sample signal from the last 12 months or so (no out-of-sample yet applied) is plotted in green, and since I have future data available (more than 60 trading days worth from 9-25 to present), I can also approximate the target symmetric filter (the theoretically optimal target signal) in order to compare things (a quite useful option available with the click of a button in iMetrica I might add). I do this so I can have a good barometer of over-fitting and concurrent filter robustness at the most recent in-sample observation. Figure 1 in the slide-show below, the trading signal is in green, the AAPL log-return data in red, and the approximated target signal in gray (recall that if you can approximate this target signal (in gray) arbitrarily well, you win, big). Figure 1: Trading signal with time-shift constraint set and optimized according to a financial trading criterion. Figure 2: Trading signal without the time-shift constraint set. Notice that at the very endpoint (the most challenging point to achieve greatness) of the signal in Figure 1, the filter does a very fine job at getting extremely close. In fact, since the theoretical target signal is only a Fourier approximation of order 60, my concurrent signal that I built might even be closer to the ‘true value’, who knows. Achieving exact replication of the target signal (gray) elsewhere is a little less critical in my experience. All that really matters is that it is close in moving above and below zero to the targeted intention (the symmetric filter) and close at the most recent in-sample observation. Figure 2 above shows the signal without the time-shift constraint and optimization. You might be inclined to say that there is no real big difference. In fact, the signal with no time-shift constraint looks even better. It’s hard to make such a conclusion in-sample, but now here is where things get interesting. We apply the filter to the out-of-sample data, namely the 60 tradings days. Figure 3 shows the out-of-sample performance over these past 60 trading days, roughly October, November, and December, (12-31-2012 was the latest trading day), of the signal without the time-shift constraint. Compare that to Figure 4 which depicts the performance with the constraint and optimization. Hard to tell a difference, but let’s look closer at the vertical lines. These lines can be easily plotted in iMetrica using the plot button below the canvas named Buy Indicators. The green line represents where the long position begins (we buy shares) and the exit of a short position. The magenta line represents where selling the shares occurs and the entering of a short position. These lines, in other words, are the turning point detection lines. They determine where one buys/sells (enter into a long/short position). Compare the two figures in the out-of-sample-portion after the light cyan line (indicated in Figure 4 but not Figure 3, sorry). Figure 3: Out-of-sample performance of the signal built without time-shift constraint The out-of-sample period beings where the light cyan line is from Figure 4 below. Figure 4: Out-of-sample performance of the signal built with time-shift constraint and optimized for turning point-detection, The out-of-sample period beings where the light cyan is. The optimized time-shift signal is clearly better, with an ROI of nearly 40 percent in 3 months of trading. Compare this to roughly 30 percent ROI in the non-constrained signal. I’ll take the optimized time-shift constrained signal any day. I can sleep at night with this type of trading signal. Notice that this trading was applied over a period in which Apple Inc. lost nearly 20 percent of its share price. Another nice aspect of this trading frequency interval that I used is that trading costs aren’t much of an issue since only 10 transactions (2 transaction each trade) were made in the span of 3 months, even though I did set them to be .01 percent for each transaction nonetheless. To dig a bit deeper into plausible reasons as to why the optimization of the time-shift constraint matters (if only even just a little bit), let’s take a look at the plots of the coefficients of each respective filter. Figure 5 depicts the filter coefficients with the optimized time-shift constraint, and Figure 6 shows the coefficients without it. Notice how in the filter for the AAPL log-return data (blue-ish tinted line) the filter privileges the latest observation much more, while slowly modifying the others less. In the non optimized time-shift filter, the most recent observation has much less importance, and in fact, privileges a larger lag more. For timely turning point detection, this is (probably) not a good thing. Another interesting observation is that the optimized time-shift filter completely disregards the latest observation in the log-return data of GOOG (purplish-line) in order to determine the turning points. Maybe a “better” financial asset could be used for trading AAPL? Hmmm…. well in any case I’m quite ecstatic with these results so far. I just need to hack my way into writing a better time-shift optimization routine, it’s a bit slow at this point. Until next time, happy extracting. And feel free to contact me with any questions. Figure 5: The filter coefficients with time-shift optimization. Figure 6: The filter coefficients without the time-shift optimization. ¹ I won’t disclose quite yet how I found these optimal parameters and frequency interval or reveal what they are as I need to keep some sort of competitive advantage as I presently look for consulting opportunities 😉 . Animation 1: Click to view animation. Periodogram and Various Frequency Intervals. Animation 2: Click to view the animation. 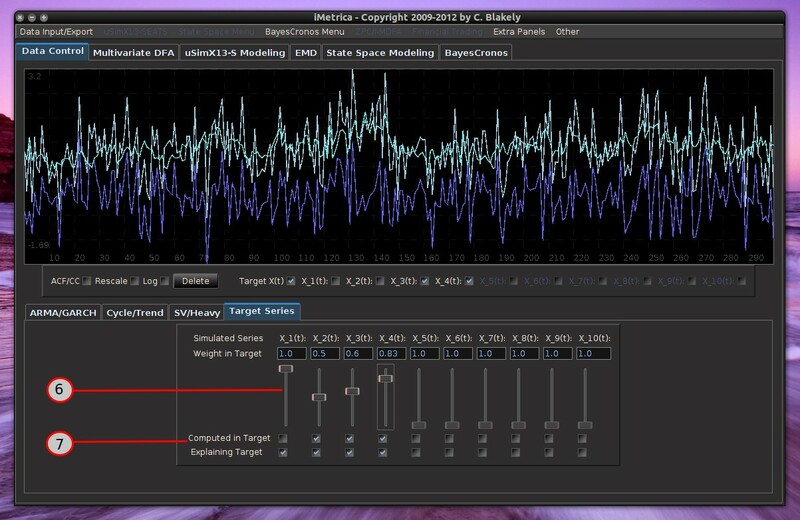 The in-sample performance of the trading signal for each frequency sweep shown in the animation above. When constructing signals for buy/sell trades in financial data, one of the primary parameters that should be resolved before any other parameters are regarded is the trading frequency structure that regulates all the trades. The structure should be robust and consistent during all regimes of behavior for the given traded asset, namely during times of high volatility, sideways, or bull/bear markets. In the MDFA approach to building trading signals, the trading structure is mostly determined by the characteristics of the target transfer function, the function that designates the areas of pass and stop-band frequencies in the data. As I argue in this article, I demonstrate that there exists an optimal frequency band in which the trades should be made, and the frequency band is intrinsic to the financial data being analyzed. Two assets do not necessarily share the same optimal frequency band. Needless to say, this frequency band is highly dependent on the frequency of the observations in the data (i.e. minute, hourly, daily) and the type of financial asset. Unfortunately, blindly seeking such an optimal trading frequency structure is a daunting and challenging task in general. Fortunately, I’ve built a few useful tools in the iMetrica financial trading platform to seamlessly navigate towards carving out the best (optimal or at least near optimal) trading frequency structure for any financial trading scenario. I show how it’s done in this article. We first briefly summarize the procedure for building signals with a targeted range of frequencies in the (multivariate) direct filter approach, and then proceed to demonstrate how it is easily achieved in iMetrica. In order to construct signals of interest in any data set, a target transfer function must first be defined. This target filter transfer function defined on controls the frequency content of the output signal through the computation of the optimal filter coefficients. Defining for some collection of filter coefficients , recall that in the plain-vanilla (univariate) direct filter approach (for ‘quasi’ stationary data), we seek to find the coefficients such that is minimized, where is a ‘smart’ weighting function that approximates the ‘true’ spectral density of the data (in general the periodogram of the data, or a function using the periodogram of the data). By defining as a function that takes on the value of one or less for a certain range of values in and zero elsewhere, we pinpoint exotic frequencies where we wish our filter to extract the features of the data. The characteristics of the generated output signal (after the resulting filter has been applied to the data) are those intrinsic to the selected frequencies in the data. The characteristics found at other frequencies are (in a perfect world) disregarded from the output signal. As we show in this article, the selection of the frequencies when defining provides the utmost in importance when building financial trading signals, as the optimal frequencies in regards to trading performance vary with every data set. As mentioned, much emphasis should be applied to the construction of this target and finding the optimal one is not necessarily an easy task in general. With a plethora of other parameters that are involved in building a trading signal, such as customization and regularization (see my article on financial trading parameters), one could just simply select any arbitrary frequency range for and then proceed to optimize the other parameters until a winning trading signal is found. That is, of course, an option. But I’d like to be an advocate for carving out the proper frequency range that’s intrinsically optimal for the data set given, namely because I believe one exists, and secondly because once in the proper frequency range for the data, other parameters are much easier to optimize. So what kind of properties should this ‘optimal’ frequency range possess in regards to the trading signal? Consistency. Provides out-of-sample performance akin to in-sample performance. Optimality. Generates in-sample trade performance with rank coefficient above .90. Robustness. Insensitive to small changes in parameterization. Most of these properties are obvious when first glancing at them, but are completely nontrivial to obtain. The third property tends to be overlooked when building efficient trading signals as one typically chooses a parameterization for a specific frequency band in the target , and then becomes over-confident and optimistic that the filter will provide consistent results out-of-sample. With a non-robust signal, small change in one of the customization parameters completely eradicates the effectiveness and optimality of the filter. An optimal frequency range should be much less sensitive to changes in the customization and regularization of the filter parameters. Namely, changing the smoothing parameter, say 50 percent in either direction, will have little effect on the in-sample performance of the filter, which in turn will produce a more robust signal. To build a target transfer function , one has many options in the MDFA module of iMetrica. The approach that we will consider in this article is to define directly by indicating the frequency pass-band and stop-band structure directly. The simplest transfer functions are defined by two cutoff frequencies: a low cutoff frequency and a high-cutoff frequency . In the Target Filter Design control panel (see Figure 1), one can control every aspect of the target transfer function function, from different types of step functions, to more exotic options using modeling. For building financial trading signals, the Band-Pass option will be sufficient. The cutoff frequencies and are adjusted by simply modifying their values using the slider bars designated for each value, where three different ways of modifying the cutoff frequency values are available. The first is the direct designation of the value using the slider bar which goes between values of by changes of .01. The second method uses two different slider bars to change the values of the numerator and denominator where and/or is written in fractional form , a form commonly used for defining different cycles in the data. The third method is to simply type in the value of the cutoff in the designated text area and then press Enter on the keyboard, where the number must be a real number in the interval and entered in decimal form (i.e. 0.569, 1.349, etc). When the Auto checkbox is selected, the new direct filter and signal will be computed automatically when any changes to the target transfer function are made. This can be a quite useful tool for robustness verification, to see how small changes in the frequency content affect the output signal, and consequently the trading performance of the signal. Figure 1: Target filter design panel. 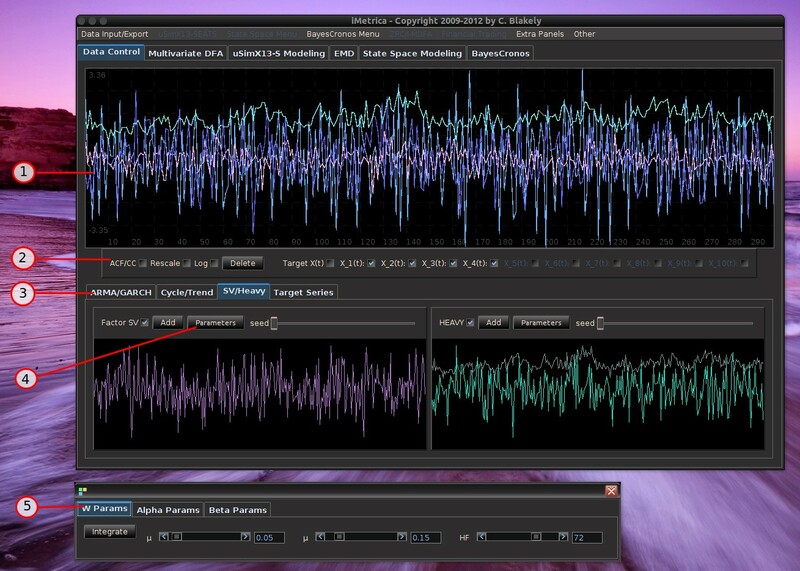 Although cycling through multiple frequency ranges to find the optimal frequency bands for in-sample trading performance can be seamlessly accomplished by just sliding the scrollbars around (as shown in Animations 1 and 2 at the top of the page), there is a much easier way to achieve optimality (or near optimality) automatically thanks to a Financial Trading Optimization control panel featured in the Financial Trading menu at the top of the iMetrica interface. Once in the Financial Trading interface, optimization of both the customization parameters for timeliness and smoothness, along with optimization of the frequency bands can be accomplished by first launching the Trading Optimization panel (see Figure 2), and then selecting the optimization criteria desired (maximum return, minimum loss, maximum trade success ratio, maximum rank coefficient,… etc). To find the optimal customization parameters, simply select the optimization criteria from the drop-down menu, and then click either the Simulated Annealing button, or Grid Search button (as the name implies, ‘grid search’ simply creates a fine grid of customization values and smoothing expweight and then chooses the maximal value after sweeping the entire grid – it takes a few seconds depending on the length of the filter. The method that I prefer for now). After the optimal parameters are found, the plotting canvas in the optimization panel paints a contour plot of the values found in order to give you an idea of the customization geometry, with all other parameterization values fixed. The frequency bandwidth of the target transfer function can then be optimized by a quick few millisecond grid search by selecting the checkbox Optimize bandwidth only. In this case the customization parameters are held fixed to their set values, and the optimization proceeds to only vary the frequency parameters. The values of the optimization function produced during the grid-search are then plotted on the optimization canvas to yield the structure from the frequency domain point-of-view. This can be helpful when comparing different frequency bands in building trading signals. It can also help in determining the robustness of the signal, by looking at the near neighboring values found at the optimal value. Figure 2: The financial trading optimization panel. Here the values of the optimization criteria are plotted for all the different frequency intervals. The interval with the maximum value is automatically chosen and then computed. We give a full example of an actual trading scenario to show how this process works in selecting an optimal frequency range for a given set of market traded assets. The outline of my general step-by-step approach for seeking good trading filters goes as follows. Select the initial frequency band-pass by first initializing the interval to . Setting to .10-.15 is usually sufficient. Set the checkbox Fix-Bandpass width in order to secure the bandwidth of the filter. In the optimization panel (Figure 2), click the checkbox Optimize Bandwidth only and then select the optimization criteria. In these examples, we choose to maximize the rank coefficient, as it tends to produce the best out-of-sample trading performance. Then tap the Grid Search button to find the frequency range with the maximum rank coefficient. This search takes a few milliseconds. With the initialization of the optimal bandwidth, the customization parameters can now be optimized by deselecting the Optimize Bandwidth only and then tapping the Grid Search button once more. Depending on the length of the filter and the number of addition explaining series, this search can take several seconds. Repeat steps 2 and 3 until a combination is found of customization and filter bandwidth that produces a rank coefficient above .90. Also, test the robustness of the trading signal by slightly adjusting the frequency range and the customization parameters by small changes. A robust signal shouldn’t change the trading statistics too much under slight parameter movement. Once content with the in-sample trading statistics (the Trading Statistics panel is available from the Financial Trading Menu), the final step is to apply the filter to out-of-sample data and trade away. Provided that sufficient regularization parameters have been selected prior to the optimization (regularization selection is out of the scope of this article however) and the optimized trading frequency bandwidth was robust enough, the out-of-sample performance of the signal should perform akin to in-sample. If not, start over with different regularization parameters and filter length, or seek options using adaptive filtering (see my previous article on adaptive filtering). In our example, we trade on the daily price of GOOG by using GOOG log-return data as the target data and first explanatory series, along with AAPL daily log-returns as the second explanatory series. After the four steps taken above, an optimal frequency range was found to be , where the in-sample period was from 6-3-2011 to 9-21-2012. The post-optimization of the filter, showing the MDFA trading interface, the in-sample trading statistics, and the trading optimization is shown in Figure 3. Here, the in-sample maximum rank coefficient was found to be at .96 (1.0 is the best, -1.0 is pitiful), where the trade success ratio is around 67 percent, a return-on-investment at 51 percent, and a maximum loss during the in-sample period at around 5 percent. Applying this filter out-of-sample on incoming data for 30 trading days, without any adjustments to the filter, we see that the performance of the signal was very much akin to the performance in-sample (see Figure 5). At the end of the 30 out-of-sample trading days after the in-sample period, the trading signal gives a 65 percent return for a total of a 14 percent return-on-investment in 30 trading days. During this period, there were 6 trades made (3 buys and 3 sell shorts), and 5 of them were successful (with a .1 percent transaction cost for any trade), which amounts to, on average, one trade per week. Figure 3. After in-sample optimization on both the customization and filter frequency band. Figure 4: After applying the constructed filter on the next 30 days out-of-sample. The other filter parameters (customization, regularization, and filter length ) have been blurred-out on purpose for obvious reasons. However, interested readers can e-mail me and I’ll send the optimal customization and regularization parameters, or maybe even just the filter coefficients themselves so you can apply them to data future GOOG and AAPL data and experiment.) We then apply the filter out-of-sample for 30 days and make trades based on the output of the trading signal. In Figure 4, the blue-to-pink line represents the performance of the trading account given by the percentage returns from each trade made over time. The grey line is the log-price of GOOG, and the green line is the trading signal constructed from the filter just built applied to the data. It signals a ‘buy’ when the signal moves above the zero line (the dotted line) and a sell (and short-sell) when below the line. Since the data are the daily log-returns at the end each market trading period, all trades are assumed to have been made near or at the end of market hours. Notice how successful this chosen frequency range is during the times of highest volatility for Google being in this example the first 60 day period of the in-sample partition (roughly September-October 2011). This in-sample optimization ultimately helped the 30 days out-of-sample period where volatility increased again (with even an 8 percent drop on October 17th, 2012). Out of all the largest drops in the price of Google in both the in-sample and out-of-sample period, the signal was able to anticipate all of them due to the smart choice of the frequency band and then end up making profits by short-selling. To summarize, during an out-of-sample period in which GOOG lost over 10 percent of their stock price, the optimized trading signal that was built in this example earned roughly 14 percent. We were able to accomplish this by investigating the properties of the behavior of different frequency intervals in regard to not only the optimization criteria, but also areas of robustness in both the values of the filter frequency intervals as well as customization controls (see the animations at the top of this article). This is mostly aided by the very efficient and fast (this is where the gnu-c language came in handy) financial trading optimization panel as well as the ability in iMetrica to make any changes to the filter parameters and instantaneously see the results. Again, feel free to contact me for the filter parameters that were found in the above example, the filter coefficients, or any questions you may have. Happy New Year and Happy Extracting! Have you ever seen the movie Inception and wondered, “Gee, wouldn’t it be neat if I could do all that fancy subconscious dream within a dream manipulation stuff”? Well now you can (in a metaphorical way) using MDFA and iMetrica. I explain how in this article. Before I begin, may I first draw your attention to a brief introduction of the context in which I am speaking, and that is real-time signal extraction in (nonlinear, nonstationary) information flow. The principle goal of filtering and signal extraction in real-time data analysis for whatever purpose necessary (financial trading, risk analysis, real-time trend detection, seasonal adjustment) is to detect and pinpoint as timely as possible a desired sequence of events in an incoming flow of data observations. We emphasize that this detection should be fast, in that the desired signal, or sequence of events, should be so robust in its timeliness and accuracy so as to detect turning points or actions in targeted events as they happen, or even become so awesome that it manages to anticipate what will happen in the future. Of course, this is never an exact science nor even always possible (otherwise we’d all be billionaires right?) and thus we rely on creative ways to cope with the unknown. We can also think of signal extraction in more abstract terms. Real-time signal extraction entails the construction of a ‘smart’ illusion, an alternative to reality, where reality in this context is a time series, the information flow, the raw data. This ‘smart’ illusion that is being constructed is the signal, the vital information that has been extracted from an abundance of “noise” embedded in the reality. And the signal must produce important underlying secrets to satisfy the needs of the user, the signal extractor. How these signals are extracted from reality is the grand challenge. How are they produced in a robust, fast, and feasible manner so as to be effective in the real-time flow of information? The answer is in MDFA, or in other words as I’ll describe in this article, penetrating the subconscious state of reality to gain access to hidden treasures. After recently re-watching the Christopher Nolan opus entitled Inception starring Leonardo DiCaprio and what seems like most of the cast from the Dark Knight Trilogy, I began to see some similarities between the main concepts entertainingly presented in the movie (using some pimped-up CGI), and the mathematics of signal extraction using the multivariate direct filtering approach (MDFA). In this article I present some of these interesting parallels that I’ve managed to weave together. My ultimate goal with this article is to hopefully paint a vivid picture of some interesting details stemming from the mathematics of the direct filtering approach by using the parallels that I’ve contrived between the two. Afterwards, hopefully you’ll be on your way to entering the realm of ‘dreaming within dreaming’, and extracting pertinent hidden secrets embedded in a flurry of noise. The film introduces a slick con man by the name of Cobb (played by DiCaprio), and his team of super well-dressed con artists with leather jackets and slicked back hair (the classic con man look right?). The catchy idea that resides in the premise of the film is that these aren’t ordinary con men: they have a unique way of manipulating reality: by entering the dreams (subconscious ) of their targets (or marks as they call them in the film) and manipulate their subconscious dream state under the goal of extracting a desired idea or hidden secret. Like any group of con men, they attempt to construct a false reality by creating a certain architecture and environment in the target’s dream. The effectiveness of this ‘heist’ to capture the desired signals in the dream relies on the quality of the architecture and environment of the dream. So how does all this relate to the mathematics of the MDFA for signal extraction. My vision can be seen as follows. In manipulating the target’s subconscious , Cobb’s group basically involves a collection of four components. Each one can be associated with a mathematical concept embedded in the MDFA. The Target – At the highest level, we have reality. The real world in which the characters, and the target (victim), live. The target victim has an abundance of hidden information among the large capacity of mostly noise, from which Cobb’s group wish to manipulate and extract a hidden secret, the signal. In the MDFA world, we can associate or represent the information flow, the time series on which we perform the signal extraction process as the target victim in the real world. This is the data that we see, the reality. This data of course is non-deterministic, namely we have no idea what the target victim has in mind for the future. The process of extracting the hidden thoughts or ideas from this target victim is akin to, in the MDFA world, the signal extraction process. The tools used to do the extracting are as follows. The Extractor – The extractor is depicted in Inception as a master con man, a person who knows how to manipulate a subject (the target) in their subconscious dreaming world into revealing their deepest mental secrets. As the extractor’s goal is manipulation of the subconscious of a target to reveal a certain signal buried within reality, the extractor must transform the real-world conscious mental state of the target from reality into the dreaming subconscious world, by inducing a dream state. The multivariate direct filtering process of transforming the data (reality) into spectral frequency space (the subconscious ) via the Fourier transform to reveal the signal given the desired target data is metaphorically very similar to this process. The Inception extractor can be seen as being parallel to the process of transforming the data from reality into a subconscious world, the spectral frequency domain. It’s in this dreaming subconscious world, the frequency domain, where the real manipulation begins, using an architect. The Architect – The Inception architect is the designer of the dream who constructs and builds the subconscious world into which the extractor brings the subject, or target. Just as the architect manipulates real world architecture and physics in order to create paradoxes like an endless staircase, folding buildings, smooth transitions from one place to another and other various phenomena otherwise impossible in the real world, the architect in the filtering world is the toolkit of filtering parameters that render the finite-dimensional metric space in which one constructs the filter coefficients to produce the desired signal. This includes the extraction rules (namely the symmetric target filter), customization for timeliness and speed, and regularization to warp and bend the finite dimensional filter metric space. Just as many different paths in the subconscious world toward the manipulation of the target subject exist and it is the architect’s job to create the optimal environment for extracting the desired signal, the architect in the direct filtering world uses the wide ranging set of filter parameters to bend and manipulate the metric space from which the filter coefficients are built and then used in the signal extraction process. Just as changing dynamics in the Inception real world (like the state of free-falling) will change the physics of the dreamt subconscious world (like floating in hotel elevator shafts while engaging in physical combat, Matrix style), changing dynamics in the information flow will alter the geometry of the consequent architecture being built for the filter. And furthermore, just as the dream architect must be highly skilled in order to manipulate correctly, the MDFA architect must be highly skilled in order to construct the appropriate space in which the optimal signal is extracted (hint hint, call me or Marc, we’re the extractors and architects). Dream within a dream – As one of the more fascinating concepts introduced in Inception, the concept of the dream within a dream was also the main trick to their success in dream manipulation. Starting from reality, each level of the dreaming subconscious state can be further transposed into another level of subconscious , namely dreaming within a dream. The dream within a dream process puts you into a deeper state of dreaming. The deeper you go, the further one’s mind is removed from reality. This is where the subject of dynamic adaptive filtering comes into play (see my previous article here for an intro and basics to dynamic adaptive filtering in iMetrica). In the direct filtering world, dynamic adaptive filtering is akin to the dream within a dream concept: Once in a level of subconscious (the spectral frequency space in MDFA), and the architect has created the dream used for manipulation (the metric space for the filter coefficients), a new level of subconscious can then be entered by introducing a newly adapted metric space based on the information extracted from the first level of subconscious. In the dream within a dream, time is the other factor. The deeper you go into a dream state, the faster your mind is able to imagine and perceive things within that dream state. For example, one minute in reality can seem like one hour in the dream state. At the next level of subconscious, at each level in the subconscious , the element of time speeds up exponentially. A similar analogy can be extracted (no pun intended) in the concept of dynamic adaptive filtering. In dynamic adaptive filtering, we first begin by extracting a signal with the desired filter architecture at the first level transformation from reality to the spectral frequency space. When new information is received and our extracted signal is not behaving how we desire, we can build a new filter architecture for manipulating the signal with the newly provided information, with all the filter parameters available to control the desired filter properties. We are inherently building a new updated filter architecture on top of the old filter architecture, and consequently building a new signal from the output of the old signal by correcting (manipulating) this old signal toward our desired goals. This is akin to the dream within a dream concept. And just like the idea of time passing much faster at each subconscious level, the effects of filter parameters for controlling regularization and speed occur at a much faster rate since we are dealing with less information, a much shorter time frame (namely the newly arrived information) at each subsequent filtering level. One can even continue down the levels of subconscious, building a new architecture on top of the previous architecture, continuously using the newly provided information at each level to build the next level of subconsciousness; dream within a dream within a dream. To summarize these analogies, I’ll be adding a graphic soon to this article that explains in a more succinct manner these parallels described above between Inception and MDFA. In the meantime, here are the temporary replacements. Haters gonna hate… extractors gonna extract. Nolan, why you leavin’ Leo out? Figure 1: A trading signal produced in iMetrica for the daily price index of GOOG (Google) using the log-returns of GOOG and AAPL (Apple) as the explanatory data, The blue-pink line represents the account wealth over time, with a 89 percent return on investment in 16 months time (GOOG recorded a 23 percent return during this time). The green line represents the trading signal built using the MDFA module using the hierarchy of parameters described in this article. The gray line is the log price of GOOG from June 6 2011 to November 16 2012. In any computational method for constructing binary buy/sell signals for trading financial assets, most certainly a plethora of parameters are involved and must be taken into consideration when computing and testing the signals in-sample for their effectiveness and performance. As traders and trading institutions typically rely on different financial priorities for navigating their positions such as risk/reward priorities, minimizing trading costs/trading frequency, or maximizing return on investment , a robust set of parameters for adjusting and meeting the criteria of any of these financial aims is needed. The parameters need to clearly explain how and why their adjustments will aid in operating the trading signal to their goals in mind. It is my strong belief that any computational paradigm that fails to do so should not be considered a candidate for a transparent, robust, and complete method for trading financial assets. In this article, we give an in-depth look at the hierarchy of financial trading parameters involved in building financial trading signals using the powerful and versatile real-time multivariate direct filtering approach (MDFA, Wildi 2006,2008,2012), the principle method used in the financial trading interface of iMetrica. Our aim is to clearly identify the characteristics of each parameter involved in constructing trading signals using the MDFA module in iMetrica as well as what effects (if any) the parameter will have on building trading signals and their performance. With the many different parameters at one’s disposal for computing a signal for virtually any type of financial data and using any financial priority profile, naturally there exists a hierarchy associated with these parameters that all have well-defined mathematical definitions and properties. We propose a categorization of these parameters into three levels according to the clarity on their effect in building robust trading signals. 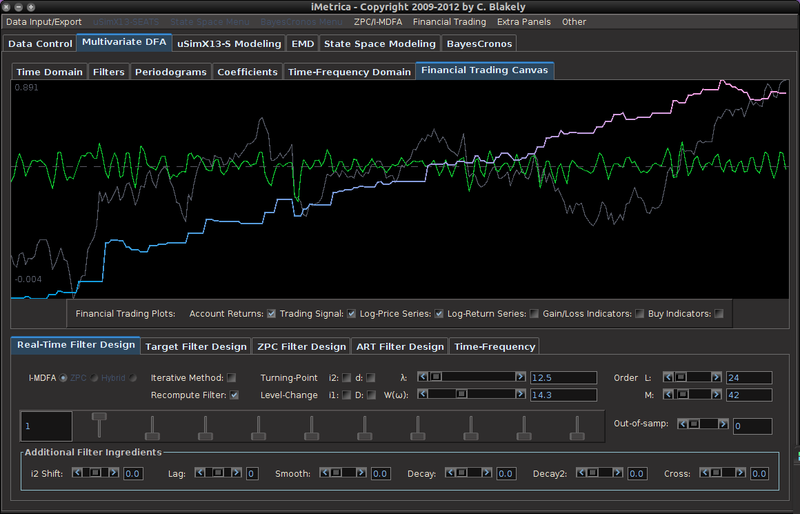 Below are the four main control panels used in the MDFA module for the Financial Trading Interface (shown in Figure 1). They will be referenced throughout the remainder of this article. Figure 2: The interface for controlling many of the parameters involved in MDFA. Adjusting any of these parameters will automatically compute the new filter and signal output with the new set of parameters and plot the results on the MDFA module plotting canvases. Figure 3: The main interface for building the target symmetric filter that is used for computing the real-time (nonsymmetric) filter and output signal. Many of the desired risk/reward properties are controlled in this interface. One can control every aspect of the target filter as well as spectral densities used to compute the optimal filter in the frequency domain. Figure 4: The main interface for constructing Zero-Pole Combination filters, the original paradigm for real-time direct filtering. Here, one can control all the parameters involved in ZPC filtering, visualize the frequency domain characteristics of the filter, and inject the filter into the I-MDFA filter to create “hybrid” filters. Figure 5: The basic trading regulation parameters currently offered in the Financial Trading Interface. This panel is accessed by using the Financial Trading menu at the top of the software. Here, we have direct control over setting the trading frequency, the trading costs per transaction, and the risk-free rate for computing the Sharpe Ration, all controlled by simply sliding the bars to the desired level. One can also set the option to short sell during the trading period (provided that one is able to do so with the type of financial asset being traded). Trading Frequency. As the title entails, the trading frequency governs how often buy/sell signal will occur during the span of the trading horizon. Regardless of minute data, hourly data, or daily data, the trading frequency regulates when trades are signaled and is also a key parameter when considering trading costs. The parameter that controls the trading frequency is defined by the cutoff frequency in the target filter of the MDFA and is regulated in either the Target Filter Design interface (see Figure 3) or, if one is not accustomed to building target filters in MDFA, a simpler parameter is given in the Trading Parameter panel (see Figure 5). In Figure 3, the pass-band and stop-band properties are controlled by any one of the sliding scrollbars. 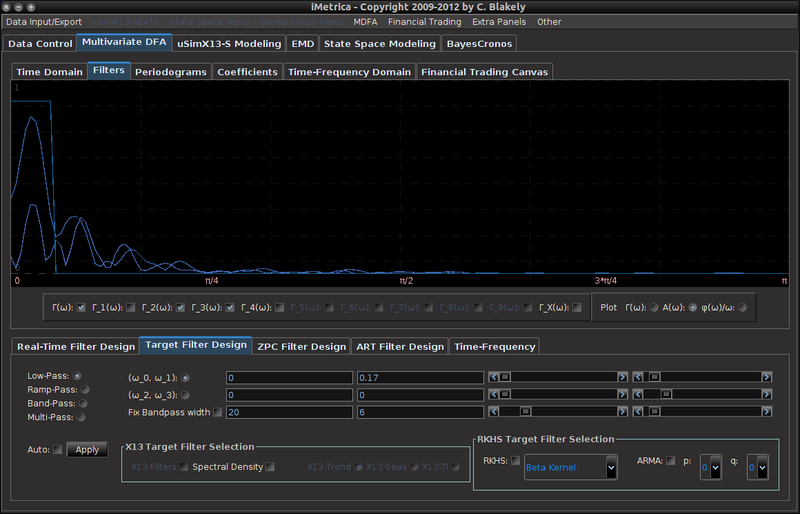 The design of the target filter is plotted in the Filter Design canvas (not shown). Timeliness of signal. The timeliness of the signal controls the quality of the phase characteristics in the real-time filter that computes the trading signal. Namely, it can control how well turning points (momentum changes) are detected in the financial data while minimizing the phase error in the filter. Bad timeliness properties will lead to a large delay in detecting up/downswings in momentum. Good timeliness properties lead to anticipated detection of momentum in real-time. However, the timeliness must be controlled by smoothness, as too much timeliness leads to the addition of unwanted noise in the trading signal, leading to unnecessary unwanted trades. The timeliness of the filter is governed by the parameter that controls the phase error in the MDFA optimization. This is done by using the sliding scrollbar marked in the Real-Time Filter Design in Figure 2. One can also control the timeliness property for ZPC filters using the scrollbar in the ZPC Filter Design panel (Figure 4). Smoothness of signal. The smoothness of the signal is related to how well the filter has suppressed the unwanted frequency information in the financial data, resulting in a smoother trading signal that corresponds more directly to the targeted signal and trading frequency. A signal that has been submitted to too much smoothing however will lose any important timeliness advantages, resulting in delayed or no trades at all. The smoothness of the filter can be adjusted through using the parameter that controls the error in the stop-band between the targeted filter and the computed concurrent filter. The smoothness parameter is found on the Real-Time Filter Design interface in the sliding scrollbar marked (see Figure 2) and in the sliding scrollbar marked in the ZPC Filter Design panel (see Figure 4). Quantization of information. In this sense, the quantization of information relates to how much past information is used to construct the trading signal. In MDFA, it is controlled by the length of the filter and is found on the Real-Time Filter Design interface (see Figure 2). In theory, as the filter length gets larger. the more past information from the financial time series is used resulting in a better approximation of the targeted filter. However, as the saying goes, there’s no such thing as a free lunch: increasing the filter length adds more degrees of freedom, which then leads to the age-old problem of over-fitting. The result: increased nonsense at the most concurrent observation of the signal and chaos out-of-sample. Fortunately, we can relieve the problem of over-fitting by using regularization (see Secondary Parameters). The length of the filter is controlled in the sliding scrollbar marked Order- in the Real-Time Filter Design panel (Figure 2). As you might have suspected, there exists a so-called “uncertainty principle” regarding the timeliness and smoothness of the signal. Namely, one cannot achieve a perfectly timely signal (zero phase error in the filter) while at the same time remaining certain that the timely signal estimate is free of unwanted “noise” (perfectly filtered data in the stop-band of the filter). The greater the timeliness (better phase error), the lesser the smoothness (suppression of unwanted high-frequency noise). A happy combination of these two parameters is always desired, and thankfully there exists in iMetrica an interface to optimize these two parameters to achieve a perfect balance given one’s financial trading priorities. There has been much to say on this real-time direct filter “uncertainty” principle, and the interested reader can seek the gory mathematical details in an original paper by the inventor and good friend and colleague Professor Marc Wildi here. Regularization of filters is the act of projecting the filter space into a lower dimensional space,reducing the effective number of degrees of freedom. Recently introduced by Wildi in 2012 (see the Elements paper), regularization has three different members to adjust according to the preferences of the signal extraction problem at hand and the data. The regularization parameters are classified as secondary parameters and are found in the Additional Filter Ingredients section in the lower portion of the Real-Time Filter Design interface (Figure 2). The regularization parameters are described as follows. Regularization: smoothness. Not to be confused with the smoothness parameter found in the primary list of parameters, this regularization technique serves to project the filter coefficients of the trading signal into an approximation space satisfying a smoothness requirement, namely that the finite differences of the coefficients up to a certain order defined by the smoothness parameter are kept relatively small. This ultimately has the effect that the parameters appear smoother as the smooth parameter increases. Furthermore, as the approximation space becomes more “regularized” according to the requirement that solutions have “smoother” solutions, the effective degrees of freedom decrease and chances of over-fitting will decrease as well. The direct consequences of applying this type of regularization on the signal output are typically quite subtle, and depends clearly on how much smoothness is being applied to the coefficients. Personally, I usually begin with this parameter for my regularization needs to decrease the number of effective degrees of freedom and improve out-of-sample performance. Regularization: decay. Employing the decay parameter ensures that the coefficients of the filter decay to zero at a certain rate as the lag of the filter increases. In effect, it is another form of information quantization as the trading signal will tend to lessen the importance of past information as the decay increases. This rate is governed by two decay parameter and higher the value, the faster the values decrease to zero. The first decay parameter adjusts the strength of the decay. The second parameter adjusts for how fast the coefficients decay to zero. Usually, just a slight touch on the strength of the decay and then adjusting for the speed of the decay is the order in which to proceed for these parameters. As with the smoothing regularization, the number of effective degrees of freedom will (in most cases) decreases as the decay parameter decreases, which is a good thing (in most cases). Regularization: cross correlation. Used for building trading signals with multivariate data only, this regularization effect groups the latitudinal structure of the multivariate time series more closely, resulting in more weighted estimate of the target filter using the target data frequency information. As the cross regularization parameter increases, the filter coefficients for each time series tend to converge towards each other. It should typically be used in a last effort to control for over-fitting and should only be used if the financial time series data is on the same scale and all highly correlated. Phase-delay customization. The phase-delay of the filter at frequency zero, defined by the instantaneous rate of change of a filter’s phase at frequency zero, characterizes important information related to the timeliness of the filter. One can directly ensure that the phase delay of the filter at frequency zero is zero by adding constraints to the filter coefficients at computation time. This is done by setting the clicking the option in the Real-Time Filter Design interface. To go further, one can even set the phase delay to an fixed value other than zero using the scrollbar in the Additional Filter Ingredients box. Setting this value to a certain value (between -20 and 20 in the scrollbar) ensures that the phase delay at zero of the filter reacts as anticipated. It’s use and benefit is still under investigation. In any case, one can seamlessly test how this constraint affects the trading signal output in their own trading strategies directly by visualizing its performance in-sample using the Financial Trading canvas. Differencing weight. This option, found in the Real-Time Filter Design interface as the checkbox labeled “d” (Figure 2), multiplies the frequency information (periodogram or discrete Fourier transform (DFT)) of the financial data by the weighting function , which is the reciprocal of the differencing operator in the frequency domain. Since the Financial Trading platform in iMetrica strictly uses log-return financial time series to build trading signals, the use of this weighting function is in a sense a frequency-based “de-differencing” of the differenced data. In many cases, using the differencing weight provides better timeliness properties for the filter and thus the trading signal. In addition to these three levels of parameters used in building real-time trading signals, there is a collection of more exotic “parameterization” strategies that exist in the iMetica MDFA module for fine tuning and constructing boosting trading performance. However, these strategies require more time to develop, a bit of experimentation, and a keen eye for filtering. We will develop more information and tutorials about these advanced filtering techniques for constructing effective trading signals in iMetrica in future articles on this blog coming soon. For now, we just summarize their main ideas. Hybrid filtering. In hybrid filtering, the goal is to filter a target signal additionally by injecting it with another filter of a different type that was constructed using the same data, but different paradigm or set of parameters. One method of hybrid filtering that is readily available in the MDFA module entails constructing Zero-Pole Combination filters using the ZPC Filter Design interface (Figure 4) and injecting the filter into the filter constructed in the Real-Time Filter Design interface (Figure 2) (see Wildi ZPC for more information). The combination (or hybrid) filter can then be accessed using one of the check box buttons in the filter interface and then adjusted using all the various levels of parameters above, and then used in the financial trading interface. The effect of this hybrid construction is to essentially improve either the smoothness or timeliness of any computed trading signal, while at the same time not succumbing to the nasty side-effects of over-fitting. Forecasting and Smoothing signals. Smoothing signals in time series, as its name implies, involves obtaining a smoother estimate of certain signal in the past. Since the real-time estimate of a signal value in the past involves using more recent values, the signal estimation becomes more symmetrical as past and future values at a point in the past are used to estimate the value of the signal. For example, if today is after market hours on Friday, we can obtain a better estimate of the targeted signal for Wednesday since we have information from Thursday and Friday. In the opposite manner, forecasting involves projecting a signal into the future. However, since the estimate becomes even more “anti-symmetric”, the estimate becomes more polluted with noise. How these smoothed and forecasted signals can be used for constructing buy/sell trading signals in real-time is still purely experimental. 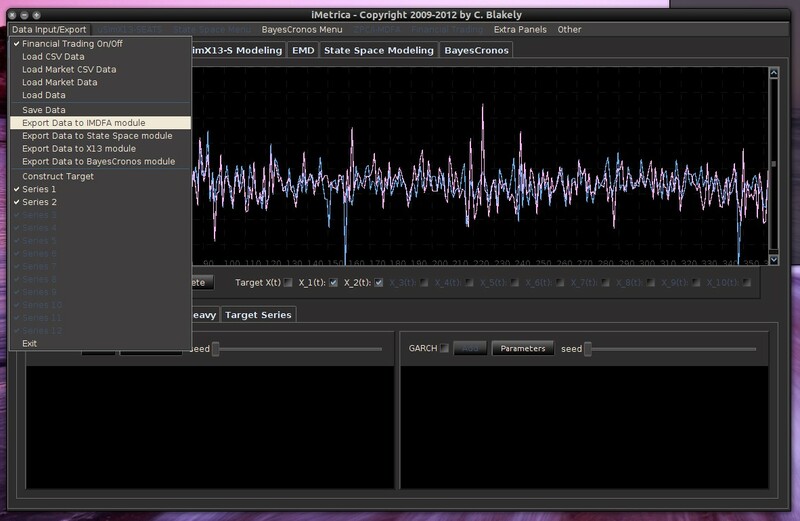 With iMetrica, building and testing strategies that improve trading performance using either smoothed and forecasted signals (or both), is available.To produce either a smoothed or forecasted signal, there is a lag scrollbar available in the Real-Time Filter Design interface under Additional Filter Ingredients that enables one to compute either a smooth or forecasted signal. Setting the lag value in the scrollbar to any integer between -10 and 10 and the signal with the set lag applied is automatically computed. For negative lag values , the method produces a step-ahead forecast estimate of the signal. For positive values, the method produces a smoothed signal with a delay of $k$ observations. Customized spectral weighting functions. In the spirit of customizing a trading signal to fit one’s priorities in financial trading, one also has the option of customizing the spectral density estimate of the data generating process to any design one wishes. In the computation of the real-time filter, the periodogram (or DFTs in multivariate case) is used as the default estimate of the spectral density weighting function. This spectral density weighting function in theory is supposed to serve as the spectrum of the underlying data generating process (DGP). However, since we have no possible idea about the underlying DGP of the price movement of publicly traded financial assets (other than it’s supposed to be pretty darn close to a random walk according to the Efficient Market Hypothesis), the periodogram is the best thing to an unbiased estimate a mortal human can get and is the default option in the MDFA module of iMetrica. However, customization of this weighting function is certainly possible through the use of the Target Filter Design interface. Not only can one design their target filter for the approximation of the concurrent filter, but the spectral density weighting function of the DGP can also be customized using some of the available options readily available in the interface. We will discuss these features in a soon-to-come discussion and tutorial on advanced real-time filtering methods. Adaptive filtering. As perhaps the most advanced feature of the MDFA module, adaptive filtering is an elegant way to achieve building smarter filters based on previous filter realizations. With the goal of adaptive filtering being to improve certain properties of the output signal at each iteration without compensating with over-fitting, the adaptive process is of course highly nonlinear. In short, adaptive MDFA filtering is an iterative process in which a one begins with a desired filter, computes the output signal, and then uses the output signal as explanatory data in the next filtering round. At each iteration step, one has the freedom to change any properties of the filter that they desire, whether it be customization, regularization, adding negative lags, adding filter coefficient constraints, applying a ZPC filter, or even changing the pass-band in the target filter. The hope is to improve on certain properties of filter at each stage of the iterative process. An in-depth look at adaptive filtering and how to easily produce an adaptive filter using iMetrica is soon to come later this week. The iMetrica software is endowed with a rich and detailed, yet quite easy-to-use module for uploading, downloading, exporting, editing, combining, transforming, building, simulating, and analyzing time series data. It contains just about anything you’d want to have in an economic or financial time series data control interface while using only simple mouse point-and-click or drag interactions to navigate or download data from the internet. Since the most important aspect of time series analysis is, well, the time series data itself, we created a dedicated data control module to handle the majority of the time series data loading and editing work, before it is exported to any one of the five iMetrica computational modules or financial trading module. We begin this iMetrica blog entry by first giving an overview of the basic components featured in the Data Control module. Figures 1 and 2 show the interface and all the major components labeled. Here, a collection of simulated time series are being plotted together. Figure 1. The major components of the data control module. Figure 2. The major components of the data control module, showing the target series editor. Main plotting canvas. This is where the time series data is plotted. Up to 10 different time series can be loaded into the data control at a time, and all of them can be plotted using the plot control in panel 2. When all the data is plotted together, to highlight a particular series, go to the main Data Control menu in the top left corner and place the mouse on any one the series names, the respective series will then be highlighted. Plot control panel. The time series that are uploaded into the module can be viewed by toggling their respective check box inside the plot control panel. This is helpful when different time series are scaled different and/or have different means. One can also log-transform the data, rescale the data to have unit standard deviations, or compare data using cross-correlations. Note that the log and rescale check box actions will only apply to the data that is currently being plotted. Furthermore, to plot the cross-correlations, only two time series can be chosen at a time. When one time series is chosen, the auto-correlation plot is drawn. Here, the “Target indicates a weighted aggregation of the data. To edit this, use the “Target Series” in 3. To delete all of the data stored in the data control module, simply press the “Delete” button. Careful, there’s no going back once deleted. Simulated and Target Series Panels. The simulated time series data interfaces to simulate a multitude of different time series. Simulating time series can be helpful when wanting to either learn, practice, or explore the different modules and capabilites of iMetrica, learn more about time series analysis, or learn about the dynamics of time series modules. The different types of models include (S)ARIMA models, GARCH models, correlated cycle models, trend models, multivariate factor stochastic volatility models, and HEAVY models. From simulating data and toggling the parameters, one can visualize instantly the effects of the each parameter on the simulated data. The data can then be exported to any of the modules for practicing and honing one’s skills in hybrid modeling, signal extraction, and forecasting. Each model has a “parameter” button (see 4) that controls the dimensions, innovation distributions, or parameter values. When changes are made, the simulated series is recomputed automatically and replotted on their respective plotting canvas (see 4). Simulated Data Control. Once the parameters have been selected, and a desired simulated series has been achieved to one’s liking, it can be added to the main data control plotting canvas by clicking the “Add” button. The new simulated series is now ready to be exported to any of the modules. One can also change the random seed that controls the “burn-in” of the innovation sequence (random effects that govern the initialization and trajectory of the data). In some of the models, one can “integrate” the data to render stationary data nonstationary. 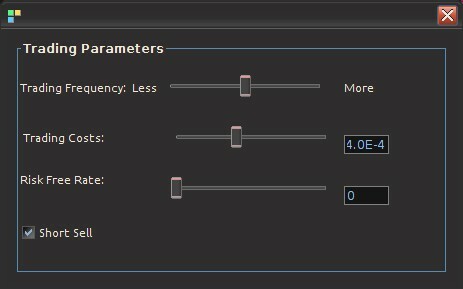 Parameter Controls. Once the “Parameters” button has been clicked, an additional panel will pop up where controls for all the model’s parameters can be toggled. Once any parameter has been changed using the sliders, scrollbars, or combo boxes, the simulated data is automatically recomputed and plotted, making it a great tool to understand time series model dynamics. Target Series Construction. The target series is used to construct a univariate time series that is a weighted sum of one or more time series (given by the for series). In modules that only deal with univariate time series data (the uSimX13, EMD, and State Space Modeling), the constructed target series is the series that gets exported for analysis. For the MDFA module, this is the series that is being filtered for constructing a signal, with the other time series acting as the explanatory time series. In the BayesCronos module, this target series is ignored and only the supporting time series data are used. In these up and down slider controls, one can adjust for the weight associated with that specific series, and the aggregate target series will be automatically recomputed as it is adjusted. Series Checkboxes. To ignore the series entirely in the computation of the target series, simply click the check box “off” in the associated “computed in target” check box. This will eliminate it from the target sum. In the case one is constructing data for the MDFA module, one has the option of utilizing a series in the target series, but not using it as an explaining time series variable, and vice-versa. Within this main data control hub, one can import univariate or multivariate time series data from a multitude of file formats, as well as download financial time series data directly from Yahoo! finance or another source such as Reuters for higher-frequency financial data. To load data from a file, simply click on the “Data Input/Export” menu when in the Data Control module and select one of the “Load” data options. The “Load Data” option pop up a “file select” panel and from there, the data file can be selected. The format of the data in this “Load Data” case is simple: a single column of data for each series. If more than one series is present, the data column must be separated by a space. In the “Load CSV” data, this assumes the file is stored in a CSV format. See Figure 3 for the menu options of the Data Control module. Figure 3. Showing the different options for importing data into the data control module. The other option for loading data into the module is through the “Load Market Data” interface. Rather than loading data from a file that is sitting in your directory, you also conveniently have the option to download data directly from the internet or financial time series database, such as Reuters. As a fast and easy way to download financial data into iMetrica, when the “Load Market Data” is selected, a pop-up panel interface will surface that gives access to controlling the download of financial market data. This is shown in Figure 4. The options on this interface are described below. Figure 4. The “Load Market Data” interface to download market data directly from Yahoo!. Here the daily log-returns and volume of Google (GOOG) and Apple (AAPL) are being downloaded. Symbols(s) – In this text box, type the market ticker symbol of the desired financial series in all CAPS. Each ticker symbol must be seperated only by one space and nothing else. Up to 10 ticker symbols can be entered. Start Date – This indicates the year, month, and day from which the financial time series begins. This date must obviously be in the past. If the day falls on a non-traded day such as a weekend or holiday, the nearest date after that date will be chosen. The time series will then be loaded to the most recent date available for that asset. Hours – This indicates the time period in which the frequency of the data is selected. In most cases, this should simply be set to “US Market Hours”. Frequency – The frequency of the data. The options are Second, Minute, 3,5,10,15,30-Minute, Hourly, Daily, Weekly, Monthly. New Data Set – Deletes all the data already stored in the data control module and uploads as new data. Log Returns – Download the data in log-return format. This is usually the case when using the data to build financial trading strategies using the MDFA module. However, in addition to the log-return data, it will also download the log-transformed raw time series data of the first asset in the Symbols(s) box. This is generally used for gauging financial trading accounts in the financial trading interface of iMetrica. When Financial Trading is turned on in the data control menu this is automatically set on. Volume Data – In addition to the asset time series data, the volume (of trades) data associated for the given frequency will also be downloaded for each market ticker symbol given in Symbols(s). Yahoo! Source – The financial data will be downloaded from Yahoo! finance (thus you need an internet connection). If this box is not checked, then the downloader will assume a Reuters financial database (but of course for this you need an account with Reuters). 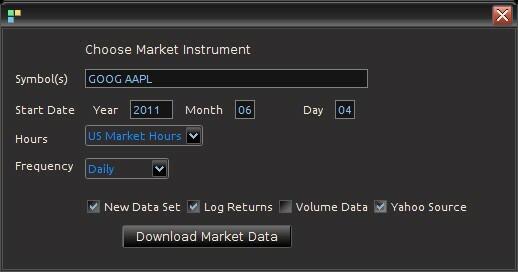 Once the settings are made in the interface, click “Download Market Data”. If no errors are present in the settings, then all the data should be automatically available in the plot canvas after a few seconds of downloading time. Figure 5 gives the results of the data download from the example in Figure 4. Here, the daily log-returns of Google (GOOG) and Apple (AAPL) along with their daily volumes from 6-4-2011 to today (11-14-2012) have been downloaded into the data control module and ready for use. Notice the scaling of the volume data (final two series) have been adjusted using the simple slider bars in the “Target Series” panel to more-or-less fit the scale of the log-return data. Figure 5. The daily log-returns of Google (GOOG) and Apple (AAPL) along with their respective volumes loaded into the data control module and plotted on the canvas. The data was uploaded by using the “Load Market Data” interface panel. If there were errors, then no data will be uploaded to the canvas and you have to try again. Common errors are either no internet connection, the symbols are either incorrect or not in CAPS, or the starting date is bogus. Once the data is available to be plotted, simply click the check boxes associated with each plot. edit, scale, export, analyse, compute, and/or trade away! More options for downloading data will constantly be added to the iMetrica software. Check back to the blog regularly for more updates and additions as they come. Of course, suggestions are always welcome.